Every pastor who has endured the rigors of seminary training will graduate having had wonderful professors under whose hand and guidance they learned about God; not just about how to study the Bible. Four of them left an indelible mark on my spiritual growth and I count them among my friends today. Not only do I think of them fondly, but I carry with me their examples of diligence in the word and the habits of study that they passed along to me. In one sense, the congregation I serve is being served by these men and many others. So, when a former student learns that the man who had so much to do with his theological and spiritual development has gone home to be with the Lord, it is good to reflect on the good deposit they have left in others. “One of my beloved seminary professors, Dr. Howard Hendricks, went to glory last week at age 89. 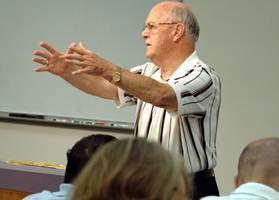 He taught Bible Study Methods and many other Christian Education courses for over 60 years at Dallas Seminary, to the staff of Campus Crusade, and all over the world. I never met even one of his students who was not marked for life by him. Below are a few quotes “Prof” was known for. I pass them on to you. Heb. 13:7 says: “Remember those who led you, who spoke the word of God to you; and considering the result of their conduct, imitate their faith.” Here is a man worthy of this statement! · Heaven is a person: Jesus. · Never traffic in unpracticed truth. · You are able to do many things. But be sure you find the one thing you must do. · There’s no one without significant creative potential. · You never graduate from the school of discipleship. · If you’re just like someone else, we don’t need you. · How big is your God? The size of your God determines the size of everything. · There’s no such thing as faith apart from risk-taking. Creativity takes risk. The people who are most secure in Jesus Christ shouldn’t be scared to try new things. · You cannot impart what you do not possess. · The teacher has not taught until the student has learned. · Nothing is more common than unfulfilled potential. · The Bible was not given to make us smarter sinners, but to change our lives. · The greatest curse that pervaded the university is apathy. · The measure of you as a leader is not what you do, but what others do because of what you do. · In the spiritual realm, the opposite of ignorance is not knowledge, it’s obedience. · A belief is something you will argue about. A conviction is something you will die for. · It is a sin to bore a child with the Word of God. · You can impress people at a distance, but you can impact them only up close. · Biblically speaking, to hear and not to do is not to hear at all. · In the midst of a generation screaming for answers, Christians are stuttering. · You can control your choices but you can’t control the outcome of those choices. · If you want to continue leading, you must continue changing. · Experience is not the best teacher; evaluated experience is. · If we stop learning today, we stop teaching tomorrow. · Leaders are readers, and readers are leaders.